GSM is the one thing mattress manufacturers do not want you to know! And once you do, you’ve got the upper hand. We promise! GSM stands for ‘Grams per square metre’. It refers to the actual weight of a particular upholstery component used within the mattress. 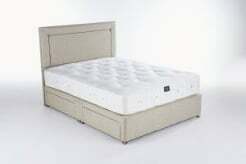 It is a measurement used by all mattress manufacturers when purchasing upholstery and used as a basis to establish the quality of a particular mattress. It is the weight of a square metre of material and it does not matter what type (wool, polyester, horsehair ) or how deep or fluffy, or how thin, or how bouncy the actual weight of a metre of the material remains a constant. It is also the weight of the entire depth of various upholstery components used directly on top of the springs and this is known as the ‘combined upholstery weight GSM’. This is the weight in One Square Metre of all upholstery used in your mattress. If you know this GSM figure – you would be able to tell which mattress is better than another without even lying on it. Take wool as an example. This comes in weights of 300 GSM / 600 GSM / 1200 GSM. You see two mattresses advertised as having wool upholstery. One has 1200 GSM wool as the upholstery. The other has just a miserly 300 GSM. They are both selling at £500. Unless you know which mattress has the 1200 GSM wool, you will never know which was the better-built mattress for the same price. Is it really important to know GSM? Absolutely! In fact, so important for you to know it is very rarely mentioned in any mattress description you will see in the store or on the internet. This is the one thing manufacturers do not want you to know or ask about, and they rarely divulge this to the retailer never mind the consumer! Once you read the explanation below you will soon see that on the majority of mattress specifications and descriptions of a mattress from the majority of retailers this blatant omission becomes evident by it’s very absence. So what is GSM in simple terms? ‘If you’re looking for the ultimate in comfort with a luxurious feel, then our Lincoln deluxe pocket spring mattress is the ideal choice. Made exclusively for Dreams with superior craftsmanship and high-quality materials, our Lincoln mattress offers you extra firm ergonomic support with 3500 pocket springs, generous pure new wool and cashmere upholstery and finished with the finest quality Belgian damask. Our Lincoln mattress is double sided and features stitched handles to allow you to prolong the life of your mattress with regular turning. The supreme quality of our Lincoln mattress makes it durable and highly desirable as an investment in a great night’s sleep. What you should be trying to do is to see where your money is going. We know that it contains 3500 springs fair enough, but what about the upholstery as the fillings? The description states quite clearly “generous pure new wool and cashmere upholstery” What exactly is deemed to be ‘generous’? The specification tells you that the key fillings are polyester/cotton, pure new wool and cashmere, but how you do you actually know that this is true? Don’t just take the above description as being what you ‘think’ you will be getting. The above is all the information this particular retailer decides to give you. But remember, they are asking about £1400 for this particular mattress so you should absolutely need to know where your money is going? How can I tell what is in a mattress? As a consumer, you need to ask the following five questions to this particular retailer or indeed all retailers and this will explain in detail what you are up against. 1. What is the combined upholstery weight? The combined upholstery weight is the total weight of all the fillings used in a square metre of the mattress upholstery. If we take for granted that for this retail price you should be looking at around 3000 GSM of premium upholstery this description tells you very little. In reality, it could be a paltry 1200 GSM and you will have no recourse because you weren’t told otherwise. 2. What is the GSM of the polyester? Polyester is amongst the cheapest mattress components you can get. Usually, given names like premium white fibre or anti-allergenic white fibre, it is still polyester and it is still cheap. If this component forms the bulk of the upholstery you are paying top whack for a cheap mattress. However, we don’t know for sure because the actual weight is not given. 3. What is the GSM of the cotton? Take note that on the description given, the cotton is forward slashed with the polyester. It is quite rare for cotton to be used as a stand-alone component (it is not fire retardant) and usually forms part of a blend. In this case, it is likely that the polyester/cotton is a component known as RPC (rebound poly cotton) not a bad component but not premium either. This comes in weights of 300 GSM / 600 GSM / and multiples thereof. As no GSM is given you can be buying a paltry 300 GSM or an acceptable 1200 GSM. You don’t know! 4. What is the GSM of the pure new wool? Again, same story. Pure new wool is amongst the most expensive components within a mattress. The description has again forward slashed this with cashmere. A reasonable person may assume that these are separate components but are they? Wool is often used as a blend (usually with cotton on high-end mattresses) and 1200 GSM is an acceptable weight obviously if backed up with other substantial fillings. There is a component known as WSC (wool, silk, cashmere) and comes with a weight of around 300 GSM. This weight is neither use nor ornament unless again it is supplementary to a substantial level of upholstery. If you see the description of wool, silk and cashmere on a product description you can assume it is there to make the mattress look as though it is packed with premium components. However, without a gsm weight attached the actual weight could be so minimal it is worthless. 5. What is the GSM of the cashmere? Cashmere is a premium component and this is more than likely part of a blend. The description is a little misleading as like the pure new wool above it is forward slashed with another product. Being part of a blend, say with pure new wool you will then have to know the ratio. Cashmere is phenomenally expensive and so don’t be surprised if the ratio of cashmere to wool is as little as 5% of the entire GSM. The fact that it can legally be included within a product description has more value than the component itself. And that’s it. A little scratch on the surface which from a simple description and basic specification of a mattress that is retailing at £1400 or so opens up a complete minefield of questions and doubt. This is a classic example of why you are going to find purchasing a mattress so ridiculously hard, frustrating but completely unnecessary. There is no legal requirement for a manufacturer or retailer to divulge the contents by weight to you but that does not make it right. Looking at the description above even we cannot tell you what the weight and breakdown of the upholstery layers are – they are complete unknowns and without you knowing what these are it becomes quite impossible for you to do any kind of comparison to other models. And this is the sole reason why this shameless practice is carried on. You may be thinking that all of this is completely mind bending and complicated it is initially but it is absolutely essential you understand it otherwise, you will be at the complete and utter mercy of the manufacturer and retailer. The moral to all of this is not to take any description at face value. The least you need to know is the ‘grams per square metre’ of all components used within the mattress. If a mattress description tells you it is filled with ‘luxurious horsehair’ or has ‘sumptuously soft silk’ you need to be asking but how much? This is just the starter post on understanding what it will take to find your perfect mattress. As with the Dreams Lincoln example above you have to know how to do comparisons between different models to see which is giving you the best mattress for your money. For us, it has now become second nature, and we know this will be a considered exercise for you. There is absolutely no need to panic! Once you understand what to look for you will be skimming through descriptions like a demon and quite enjoy spotting the misleading and dubious specifications you come up against. There really should be no reason why you should go to these extraordinarily long lengths having to play Sherlock Holmes and phoning manufacturers to ask the necessary detail on upholstery before you hand over hundreds or even thousands of pounds for your mattress. To be honest, it’s absolutely disgraceful that you will have to do this to compare. The GSM value of upholstery is the one thing 99% of ALL manufacturers do not want you to know. We hope that manufacturers and retailers will eventually tire of the calls and questions and list their products the same way as food manufacturers do with a completely itemised summary showing component and weight.